Making it in the rap game naturally requires at least some luck. Proving that you’re the artist that labels or the public should listen to in a sea of talent is inherently a task that requires a little bit of chance to be mixed with talent. Other rappers are making it out of situations where, to reference Nas, making it to 20 is a blessing. Many overlook the fact that staying afloat after making it requires luck, too. That’s where some rappers see their luck run out. Just look at the Bad Boy roster (shout out to Loon and Red Cafe) and Young Money (many artists on the label haven’t even released an album yet). When all that is considered, the following rappers have it pretty good given the landmines they hit to reach their current status. Some, like Chamillionaire, decided to refocus their energy outside of rap. Others were granted a second life, either after a prison sentence or some sort of career purgatory. However, all of the following 15 are thriving in some way after watching many of their peers fall into a state of perpetual struggle. And all of them have luck on their side. 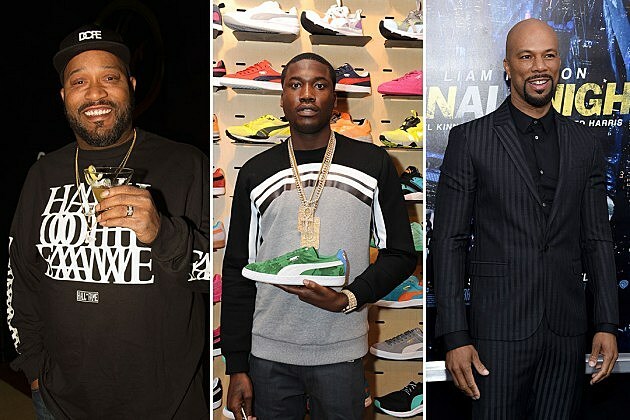 Meek Mill, Common and Riff Raff are some of the rappers who managed to survive despite hitting their own respective quagmires. See who else are making it some way, somehow through the luck of the (predominantly black) Irish with 15 Rappers That Are Way More Luckier Than You. If you’re over 20, you probably remember how big of a deal “Ridin’” was when it dropped during the MTV TRL era. If you’re the average person, you can’t name another song by Chamillionaire since this was his only hit. He maintained a good underground following with his Mixtape Messiah series, but the days of being the song on everyone’s ringtone are over. So Chamillionaire eventually decided to switch his focus away from rhyming. He became an “entrepreneur-in-residence” at Upfront Ventures, an investment firm. This meant Cham didn’t have to rap for the rest of his life and no longer had to ride dirty. The Chamillitary was proud. Bun B’s catalog isn’t as lauded as some of his peers (OutKast, but to be fair, that goes for most rap acts), but he’s done the game proud with his OG status. He’s one of the most respected rhymers in hip-hop history and a big reason is because he’s a brilliant guy outside of the verses and hooks. The rapper known to many as Bernard Freeman has been teaching courses on hip-hop and religion at Rice University and has even released a coloring book with writer Shea Serrano. It wasn’t that long ago when Swae Lee and Slim Jimmy were homeless. But the two made a party out of their poverty. Rae Sremmurd recalled that when they stayed at an abandoned house, they decided to work on music and invite people over for parties. That’s sort of their thing now. They don’t just turn up; they’ve gained renown for turning up. They had last year’s biggest hits — “No Type” and “No Flex Zone” — before they reached drinking age. Riff Raff had two things working against him. First, he was on G’s to Gents — that MTV show where Fonzworth Bentley tries to turn ruffians into his vision of a gentlemen. He lost that competition and he was losing for a long time at rap. The rapper’s debut album, Neon Icon, was constantly delayed and people didn’t know what to make of his existence: Was he a joke, and if so, was he in on it. But he’s definitely more relevant now than anybody on G’s to Gents, including Bentley. Plus, Riff Raff is transitioning into wrestling. He went on this insane pizza-based regimen to gain 55 pounds in order to make it into the ring. Riff Raff makes absurdity work. First off, Meek Mill was lucky to make it off the rough Philly streets. Surviving in the rap game is another story, though. For whatever reason, Kendrick Lamar likes to release his major label projects a week before Maybach Music Group releases, (inadvertently?) overshadowing them. Before it was announced that To Pimp a Butterfly would be released a week ahead of Wale’s The Album About Nothing, Lamar’s release of the modern classic good kid, m.A.A.d city drowned out whatever noise Dreams and Nightmares brought a week later. Fortunately, Meek’s debut had that thrilling intro, which became one of the genre’s big showstoppers and instant quotable of the decade. Meek got lucky again after prison. He has the arduous task of re-building hype for Dreams Worth More Than Money after Rick Ross’s two middling 2014 releases. But hey, the dude somehow scooped up Nicki Minaj. Common albums don’t sell anymore. Despite critical respect and the fact that he’s Common, Nobody’s Smiling sold less than 40,000 — a disappointment even by today’s standards. Fortunately, at 42, the MC doesn’t need to rely on rap. He has movies and poorly conceived television shows (it must’ve been a damn good pitch that sold a furniture show hosted by Common). He also has “Glory.” Common made up for his stoic performance in Selma with that duet with John Legend. Plus, the two put on an Oscars performance so good that it made Selma’s Martin Luther King David Oyelowo cry. Not the kind where your eyes water up and a tear accidentally falls. Oyelowo lost himself so much there was some snot leaking. Common is doing fine. The “Southern Hospitality” rapper is vaguely at the same situation as Common: bad album sales but a versatile hustle. Ludaverse isn’t going to do much damage on the charts even though this has been in the making for five years. But it’s OK. The Fast & Furious franchise still exists and it will surely rake in big bucks, which means more money in the bank for Ludacris. Queen Latifah created a blueprint for women in hip-hop while outlasting the men. She currently stands as one of the Native Tongues Posse’s most visible members next to Q-Tip. The “Ladies First” creator also survived personal trauma, including the death of her brother in a motorcycle accident and drug abuse. Her talk show may have gotten canceled, but after officiating 33 weddings during Macklemore’s performance of “Same Love” at the 2014 Grammys (in an unbelievably corny sequence, but at least she did the honors), the sky’s the limit for the Queen. It’s crazy to think this now, especially after the greatness of Clipse, but there was a point in time when people genuinely didn’t think King Push was going to make it as a solo artist. He had some of the worst songs on his first solo mixtape, Fear of God. Plus, he was on the same label as Kanye West, a diva who easily overshadowed many of his own G.O.O.D. Music signees (CyHi Da Prynce should’ve gotten more shine). But “Numbers on the Boards” and My Name Is My Name were very good. Faith was restored and Pusha T, at the archaic rapping age of 37, still has an anticipated album on the way. Bishop Nehru is luckier than you for a very basic, yet frustrating reason. We’ve been waiting over 10 years for that follow-up to Madvillainy. Bishop is 18 years old and got to record a whole project, NehruvianDOOM, with MF Doom before that drops — if ever. Granted, the kid is talented. But come on, man. Unlike most on the list, Azealia Banks could not stop shooting herself in the foot once she started climbing the ladder of success. It was as if it was her mission to undo all of the hype “212” brought in 2011. The following three years brought almost nothing other than Twitter beefing, label bickering and endless album delays. Banks finally split with XL Recordings before the strangest thing happened: The album we waited three years for actually was pretty good. Broke With Expensive Taste was a 2014 highlight, and although Banks is still as in your face as she was before, at least we knew she’s capable of creating good art. This one is arguably the most miraculous of the 15. Charles Hamilton was supposed to be a star, but the poor man just could not keep it together. He went from prodigy to punchline with bouts of erratic behavior, incarceration and that infamous video of him getting punched by his then-girlfriend. Naming the deceased J. Dilla as an executive producer of one of his projects didn’t help him out either. Hamilton went from hyped to homeless in a short period of time. But now he’s is back. The 27-year-old got much-needed medical help for his bipolar condition and signed a deal with Republic Records in February. He’ll appear on the season finale of Empire to perform “NY Raining” with Rita Ora. It’s the start of a hopeful comeback story. People forget that hip-hop’s OG could’ve still been in jail right now. In 1993, Snoop Dogg was on trial for murder in connection with the death of gang member Phillip Woldermarian, who was shot by his bodyguard McKinley Lee. Both were acquitted in 1996, and Snoop was free to continue making hits. He did just that; Snoop survived the East vs. West Coast rivalry and being on Death Row Records to create massive hits spanning three decades. Experiencing your new single with Lady Gaga fail and getting dropped by Interscope is no way to start your career. That’s what happened to Wale, even after the success of The Mixtape About Nothing. Rick Ross, of all people, became his savior by signing him to MMG. Wale’s first single for the label, “Lotus Flower Bomb,” featuring a Miguel performance that arguably carried that song, became a hit. Four years later, Wale still has hype surrounding the upcoming The Album About Nothing. At first glance, Action Bronson is the vary thing that Ghostface Killah warned against in his “Shark N—-s” bit. His voice and non-sequitur style was just too similar. That misnomer of being a duplicate could cripple a career, but Bronson was too hilarious and had much too big of a personality for that. He proved that on each mixtape, and he’s now at the cusp of being a legitimate superstar with the release of his forthcoming LP, Mr. Wonderful.